It’s hard to truly understand the power of great writing in films until you hear that perfect rhythm of argument-counterargument between two people who you believe fully understand what they are talking about. This is the fine line that writer Arron Sorkin and director Danny Boyle bring to what is assuredly a high point of both men’s careers in the furious, pulsating Steve Jobs. 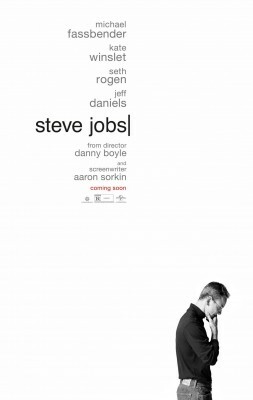 Following a literal three act story structure focusing on Jobs (Michael Fassbender) and his crew before the launch of three separate products in 1984, 1989, and the release of the iMac in 1998 is a story more about the personality of the man when faced with setbacks, stress and the acceptance of becoming a father. Known for his fast talk and walk style, Sorkin delivers a script that bounces from idea to idea on a breakneck pace that only seems to lighten when the times change. The dialogue is powered through by Fassbender who takes Jobs and presents him as honestly as seen so far on screen. The real time sections presented in the format take the viewer and show the carrying faces of its lead role as an inspiration, tyrant and abusive and captivating leader. Fassbender digs deep into the role along with outstanding performances from Seth Rogen and Kate Winslet who may very well be seeing praise this awards season as Apple’s “The Woz” and head of marketing respectively. Boyle has seen praise before in such films as Slumdog Millionaire and 127 Hours and works brilliantly here leaving his pastiche for quirky and jarring direction behind to deliver a film that is extremely confidant and assured. One aspect not wholly given praise in the film is its inspired, intricate editing. Elliot Graham edits with an attention to detail that works as an accessory to the rapid fire dialogue, weaving an already lucid film into three distinct segments that all play to their own strengths, all the while taking the wind out of the viewer.